Discounted Wine Club tickets to "The Villalobos Brothers" at the Apoyo Festival here! Discounted Wine Club tickets to "The Paperboys" and link to the Music & Wine in the Vines add-on here! Please Note: All Inspire, Ambassador & Indulge members get FREE tickets (2 per membership max) to the “Music & Wine in the Vines Wine Tasting Experience Add-On, but all guests must first purchase a Paperboys ticket to receive the Add-On whether you are paying for the add-on OR receiving it free as part of your benefit. For Inspire, Ambassador & Indulge members once you pay for your Paperboys concert tickets simply email events@caveb.com and we will verify your purchase & membership level and add you to our confirmed reservation list. Thank you! Members enjoy early access to new and limited releases, our wine club only wine our “Order of the Cave” as well as discounts on both bottles and cases at both our Quincy and Woodinville Cave B tasting rooms and through our web store. 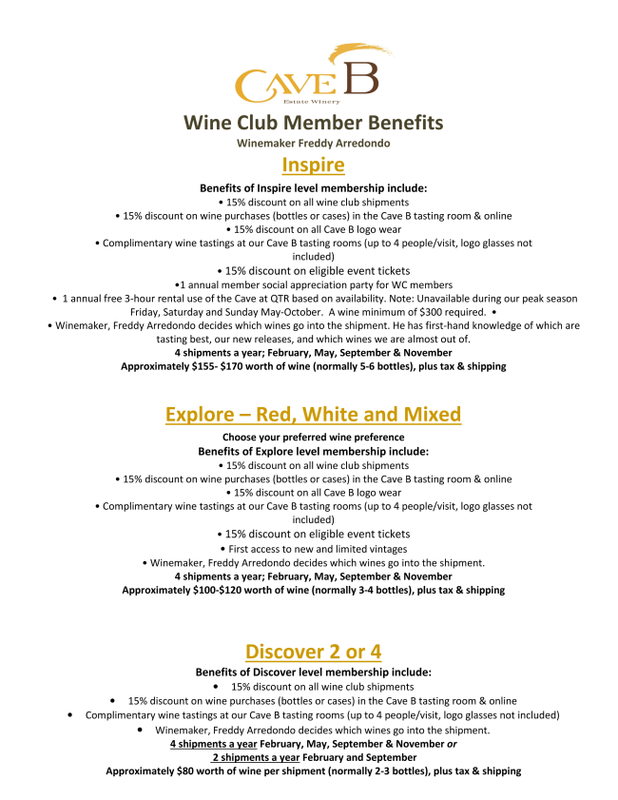 Members also receive special pricing on events such as our Winemaker’s dinner, Wine Release weekends our Grape Stomping Harvest Extravaganza & our Caveman Roar & Pour 5K Fun Run. In every shipment, members receive our newsletter, which includes tasting notes from Winemaker, Freddy Arredondo with food and wine pairing ideas for each wine, Vineyard news from Cave B Estate Winery & Vineyards owners, Vince and Carol Bryan, upcoming event happenings and updates from both our Quincy & Woodinville tasting rooms. Shipments are two or four times yearly depending on your club level. 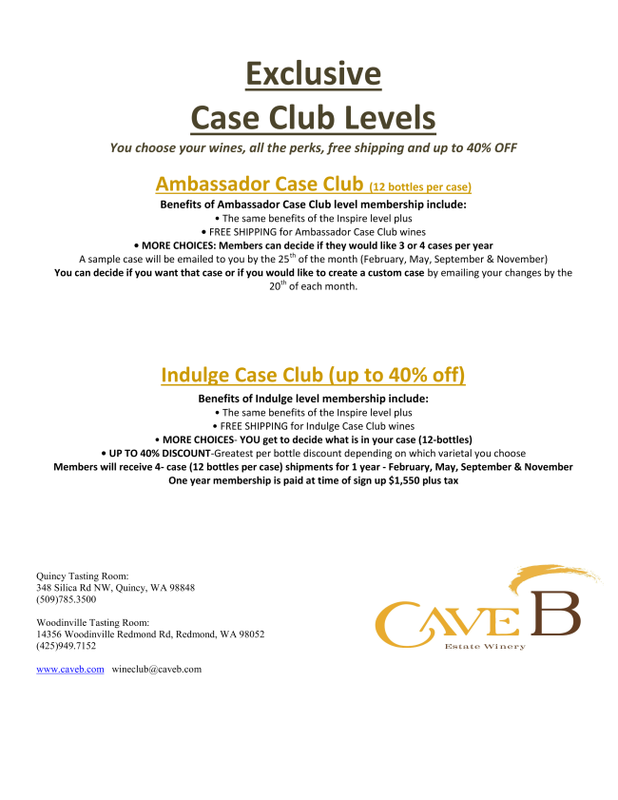 Explore the club levels, discounts, terms & conditions below and register today. For more information, email the Wine Club Manager Grace Fifield or call the Quincy tasting room at: (509) 785-3500, ext. 0. 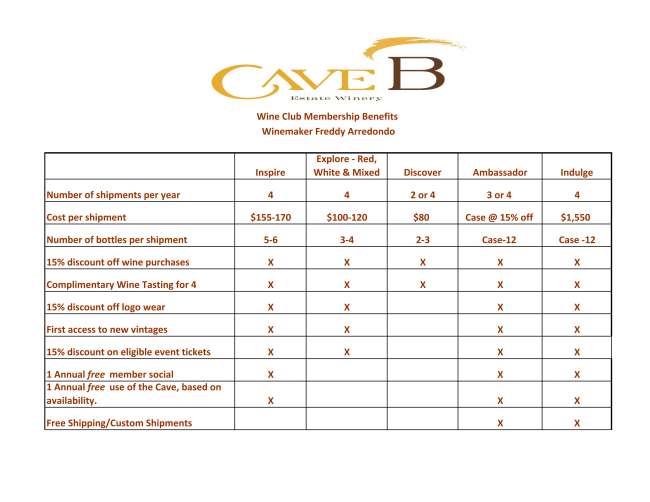 If you are a current wine club member and would like to make contact information changes to your account please email wineclub@caveb.com.